Minivan Review: A quarter of a century ago, Chrysler introduced the first minivan. The fifth generation, introduced for the 2008 model year, brings more innovation to the product segment it invented while continuing to command more than 40 percent of the minivan market. Fresh from its rebirth after government assistance in the 80’s, Chrysler’s forward-looking executives saw an opportunity and designed the “magic wagon.” Unlike full size, rear-wheel-drive vans, it had the engine and drivetrain in front of the driver, creating a flat floor. Chair-high seating was a plus, along with easy entry and exit. Compact size made it easy to drive and park. It was a huge hit, reviving the company. 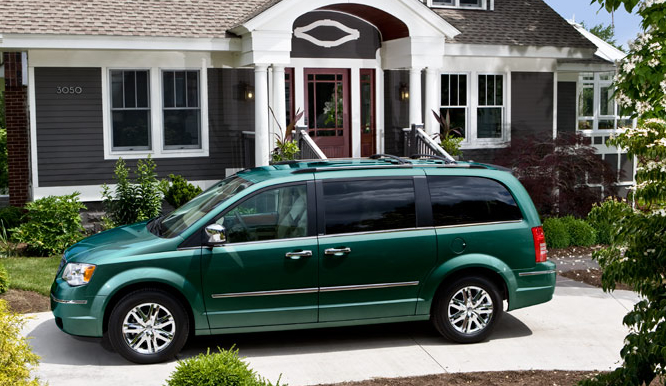 Twelve million minivans later, today’s Dodge Caravan and Chrysler Town & Country have a long history of innovation and have received more than 260 awards. The original boxy minivans became more exuberant and rounded in the 1990s. Today’s models wear a sleek, sophisticated look, borrowing design elements from Chrysler’s successful 300 sedans. That means a similar body to glass proportion, larger wheels, and more expressive faces. The Town & Country comes in three levels, LX, Touring and Limited. Each has its own V6 engine, ranging from the LX’s 3.3-liter to the Touring’s 3.8 liter to the 4.0-liter in the Limited. The 251-horsepower 4.0-liter V6 in my 2009 Limited test vehicle came with a six-speed automatic. The 3.3-liter engine makes do with only four gears, but as a flex-fuel vehicle, it can run on E85 ethanol, if you can find it. Chrysler claims fuel economy of 17 City, 25 Highway for the 4.0-liter, but I averaged only 15 mpg in mixed driving. The EPA gives the 4.0-liter engine a 7 for Air Pollution and a 5 for Greenhouse Gas scores, pretty good overall for a 4,600-pound vehicle. The 4.0-liter engine actually has the best fuel economy ratings of the three engines despite being the largest. Chalk it up to more advanced technology. The real selling point of minivans is how well they transport your family and stuff. The 2009 Chryslers have some special features. The Stow ‘n Go seating system lets you fold the second and third row seats into the floor, creating a clear, flat load space. This is a huge improvement over earlier systems, which required you to lift out heavy seats and stash them in your garage before getting the useful cargo capacity of a van. But it gets even better. The new Swivel ‘n Go system lets the second row seats turn 180 degrees and provides a table between them and the third row. So your family can play games and hang out as you roll down the road. There are even dual nine-inch overhead DVD screens, so kids can play different games simultaneously if they so desire. My Deep Crimson tester had the Swivel ‘n Go system and I was able to stow the third row in the floor with the push of a button. I also could set up the third row to face backwards with the liftgate up, perfect for beach parties, soccer games or camping. And you can perform these actions on either the left or right half of the third seat or both. The ambiance in the latest Chrysler Town & Country is rich and airy. Metallic accents and burl wood design feel upscale in the Limited model. Bright white interior lighting seems like it comes from everywhere. The gauges use an elegant typeface, something borrowed from the 300 sedans. If you’re carrying your family around then safety is a prime concern. The new Town & Country features all-row side-curtain airbags, but there’s also something especially innovative, the Blind Spot Monitoring and Rear Cross Path accident-avoidance systems. Chrysler’s minivans are the only ones that offer it. The Blind Spot Monitoring system alerts the driver with a light if there’s a car in the lane next to you that your mirrors don’t show. If you attempt to change lanes and a car is in the blind spot, a warning chime sounds. The Rear Cross Path System warns if any traffic is moving toward the vehicle whenever the car is in reverse. Both systems utilize dual ultra-wideband radar sensors. The Town & Country flows through traffic easily and quietly. Prices, including destination charges, start at $26,500 for the LX and move up to $37,300 for the Limited. There is really no more significant domestic competition in this segment, Chrysler’s success has pushed GM and Ford out of the minivan business. 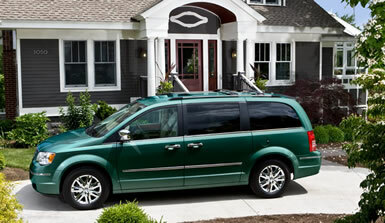 Go to your local Chrysler dealer and drive a legend, and see the best & most innovative minivan you can buy today.